ACQUA DI PARMA Blu Mediterraneo BERGAMOTTO di CALABRIA Exhilarating Shower Gel is a refreshing and sparkling shower gel that creates a deep sensation of well being while respecting the delicate balance of the skin. The soft texture gently cleanses the skin, enveloping it in the invigorating notes of BERGAMOTTO di CALABRIA. Formulated with Vitamin E and Vitamin C for instant vitality and freshness. Natural Rice Bran Oil promotes hydration. The land of Calabria. Strong and intense. With a fresh citrus burst of Bergamot. It's sparkling notes appear at the onset of this unique fragrance, enhanced by the fresh zestiness of citron. With fruit and floral accents in the heart, together with Red Ginger and Cedarwood. At the base, an unprecedented combination of Vetiver, Benzoin and Musk create this sublime and sunny fragrance. 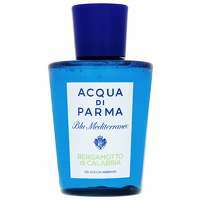 ACQUA DI PARMA Blu Mediterraneo BERGAMOTTO di CALABRIA Exhilarating Shower Gel 200ml was found on 4 websites and was price compared using EAN: 8028713571145. The cheapest ACQUA DI PARMA Blu Mediterraneo BERGAMOTTO di CALABRIA Exhilarating Shower Gel 200ml is shown as the main item, prices range from £27.65 to £32.00, excluding delivery. Price comparison based on price and delivery charges, with any valid discount codes being applied, is shown in the table above. Prices and information correct at the time of publication.